Mistral Seasonal Payment Plans mean it’s always the season to be jolly! Seasonal Payment plans from Mistral Asset Finance are available on all HP agreements. This set payment plan allows operators to make the most of peaks and troughs in cash flow by making larger payments during busier periods and smaller payments when it’s quieter. 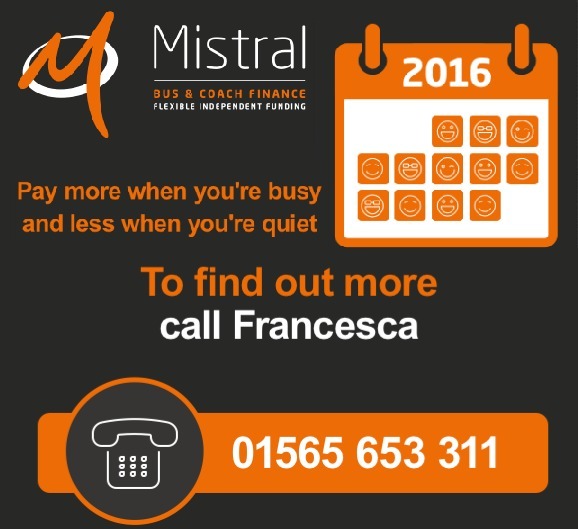 Pay more when you’re busy and less when you’re not – it’s just another way Mistral Asset Finance tailors its flexible approach to business finance. To find out more, contact your Mistral Asset Finance representative to discuss your specific business requirements and how a Seasonal Payment Plan could benefit you. Applicable on all bus, coach and mini coach finance deals – view the Mistral range now.